The epigenome provides a good measure of aging, serving as a biological clock. 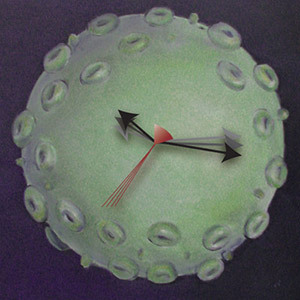 Epigenetic age is increased in antiretroviral-treated, HIV-infected individuals, represented here by a rendering of the viral surface and advancement of clock hands. Design by Robin Taylor, HIV artwork by Emily Harrison.